In SharePoint 2010 (well, 2007 too for that matter) you need to think about proper logging in your applications to ensure that any problems, issues or other events are lifted to the ULS Logs (Unified Logging System) – that way the administrators can easily view the logs and track down problems with your applications. In this article I will talk a bit about how you can utilize the logging capabilities in SharePoint 2010. 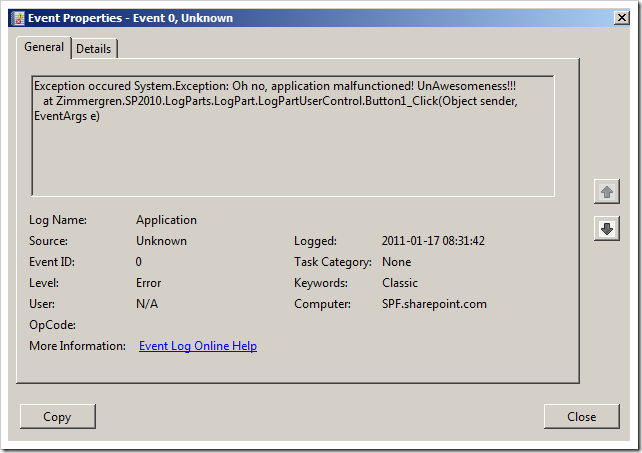 The ULS Logs are the main place for SharePoint to output it’s diagnostics information. We will take a quick look at how we can read the logs and obviously how we can write custom logging messages to the logs. With this tool you can quite easily read through the logs in SharePoint 2010 without any issues. There’s plenty of resources on the web about how to use the ULS Viewer, so go take a look at any one of them for some usage-instructions. The other side of the logs are of course writing to the logs. This is not a very hard task to do in SharePoint 2010, and I’ll outline the basic steps to do so here. It’s not very hard at all – once you’ve done that, you’re all set to kick off your custom applications and just call your custom logging method. Obviously you should create a proper logging class to take care of all your logging in your applications. Even though the ULS Logs takes care of most of the diagnostics logging today, it might be reasonable to output information into the Event Logs sometime. 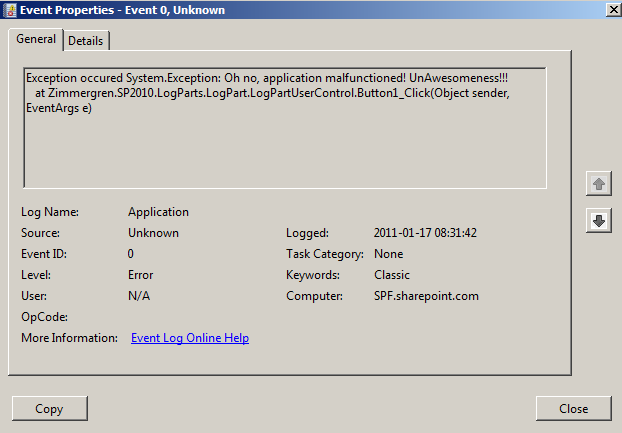 You can view the logs in the Event Logs on your SharePoint server as you would read any other logs. There’s plenty of cool things to do with the logging mechanism in SharePoint 2010, so you should definitively get your hands dirty playing around with it. As a part of the article series focusing on some general guidelines for performance in your applications, logging is a major player. If you master your logs in terms of monitoring and custom application logging you will quickly come to realize how valuable it is. This is intended as a starting point for you to get familiar with the logging-capabilities in SharePoint 2010.